581 pages | 511 B/W Illus. Urban lifelines are buried or aboveground network systems used for water, sewerage, gas, power, and telecommunications. Dedicated to preserving the functions of lifeline systems against natural disasters, the Critical Urban Infrastructure Handbook is a vital compilation of urban utility management. This text utilizes the input of leading experts who have extensive experience with natural disasters, and provides a better understanding of the technical and legal framework of infrastructure construction and operation. The book addresses water supply and sewerage, power, gas, telecommunications joint utility corridor lifeline facilities, and other critical civil infrastructure lifelines. It emphasizes the importance of the resilience of lifeline systems against natural disasters in protecting human lives and supporting survivors of disasters as well as in promptly recovering and reconstructing the affected areas. In addition, it also describes the structural damage of nodes and links, as well as the functional damage of the lifeline system from the viewpoint of disaster prevention and mitigation measures. The Critical Urban Infrastructure Handbook comprehensively describes common issues of lifeline systems, and provides practical information to engineers and industry professionals involved in the planning, construction, and maintenance of lifeline systems. "This handbook provides a comprehensive overview of the design, construction, and management of critical infrastructures that underpin economic and socioeconomic activities in urban cities. All major infrastructures are covered: water supply, sewerage, gas, electricity, and telecommunication. The contributors of the handbook have profound knowledge and experience in individual fields, and discuss the key essentials of infrastructure engineering and risk management in a concise manner. 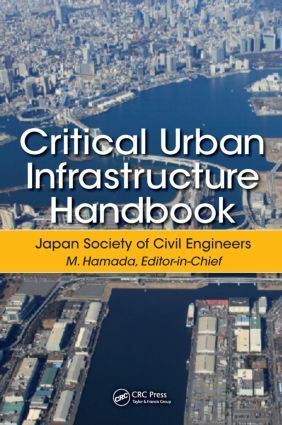 A unique aspect of this handbook is the disaster prevention and mitigation section, which is based on a long history of learned lessons dealing with the past disasters in Japan. This is a handy technical and professional book." "This is an excellent handbook written by experts in the fields of water pipeline systems, sewerage systems, natural gas distribution systems, electric power systems, and telecommunication systems. The collaborative work by the contributors has produced a reference material that can be of practical use to engineers, practitioners, and stakeholders involved in the construction, maintenance, disaster prevention, and mitigation of urban lifeline systems. … Senior undergraduate and graduate students will also benefit from this excellent reference material." Masanori Hamada is internationally recognized for his contributions to earthquake and geotechnical engineering. After receiving his undergraduate degree from Waseda University and Master’s and Ph.D. degrees from Tokyo University, he worked as a design engineer for a decade and a half in the civil engineering department of Taisei Corporation, one of the largest general contractor firms in Japan. He then served as a Professor in Tokai University for a decade before moving to Waseda University, where he served as Professor for two decades before retiring in 2014. During this period he served as the President of the Institute of Social Safety Science, the Japan Society of Civil Engineers and the Japan Association for Earthquake Engineering. He has served for more than a decade as a Member of the Science Council of Japan and since 2010 as a Board Member of the Engineering Academy of Japan. He has received a number of major awards, including the Distinguished Achievement Award of the Japan Society of Civil Engineers, and the Minister’s Award of the Ministry of Economics and Industry of Japan. Takeshi Koike served as Professor of Structural Dynamics for Civil Engineering Systems, Kyoto University (Japan), and was a Professor of Tokyo City University (Tokyo). He is an expert for the structural analysis, risk assessment and design formulation of infrastructures and lifeline network systems for natural hazards risk. He has engaged in many international research projects on seismic hazard and vulnerability analysis of lifeline network systems which include water, gas and electric power systems in the Middle East counties and Philippines. As a Professional Engineer, he consults to the pipe fabricating industry, city gas supply companies and water service agencies in Japan. And also as an Academic Advisor of Japan International Cooperation Agency (JICA), he is working for the Project : "Enhancement for Engineering Higher Education in Myanmar". Takanobu Suzuki is a Professor of Toyo University (Japan), and he was engaged as a civil structural engineer by Nippon Telegraph and Telephone Company (NTT). He is an expert of infrastructure of telecommunications and other urban lifeline structures such as water service and gas supply. He works with researchers of NTT or Tokyo Gas Company (Japan) to develop mitigation of disaster failure or loss by structural improvement. He has been awarded in seismic damage prediction method and monitoring method for telecommunication system and gas supply system. Charles Scawthorn served as Professor and head of the Earthquake Disaster Prevention Systems Laboratory, Kyoto University (Japan), and has been Visiting Professor at Waseda University (Tokyo), Beijing University and Stanford University. He is internationally recognized as an authority for the analysis and mitigation of natural and technological hazards, having led technical development of methods for rapid seismic risk analysis of buildings (FEMA 154), seismic vulnerability assessment of US national infrastructure (FEMA 224), stochastic models of fires following earthquakes, models for optimizing urban land use with respect to natural hazards risk, general loss estimation models for earthquake, wind and flood, and seismically reinforcing low-strength masonry buildings. As President of SPA Risk LLC, he consults to the global insurance industry, the World Bank, local/state/federal agencies and Global 1000 corporations.